As always, I have been running around like a chicken without a head! So needless to say, I have been a bit behind on posting to our blog. So without getting too wordy, here are some projects that I have worked on, but haven't taken the time to blog about! This vintage dresser was painted in CeCe Caldwell's Young Kansas Wheat and Vintage White. I love the detail on this dresser. I especially love the hardware on this dresser. So feminine. This was a project that Mr. T and I worked on together. Mr. T painted the desk in Traverse City Cherry, then my brain went into over drive. What about a flag theme. So Mr. T was on a mission! The blue he used was a custom mix of Maine Harbor Blue and Vermont Slate. He also used Vintage White for the white drawers. I painted the stars on the blue drawers. Then he waxed the entire piece in clear and I went back and added the aging wax. And then, buffed, and buffed, and buffed to get that perfect finish. I think it turned out fantastic! This is a lamp I found at Goodwill and had sitting in my garage. I found the shade about 3 months later. Ding, Ding, Ding....light bulb was going off! Perfect match...once I painted! 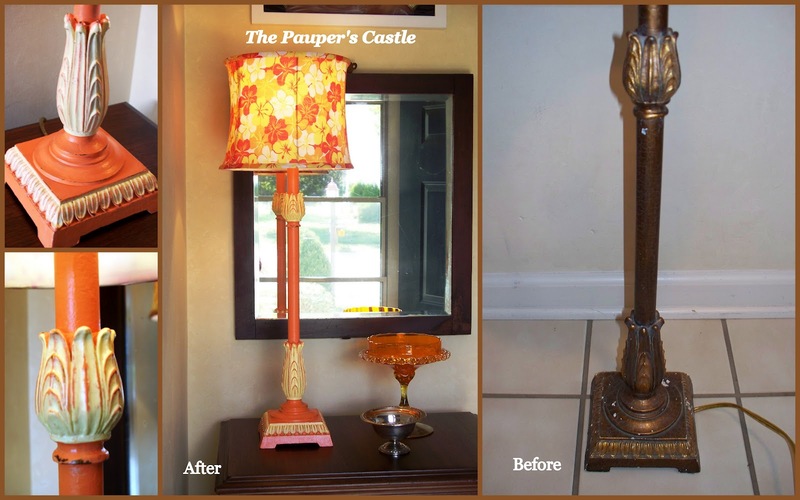 This lamp was painted in CeCe Caldwell's Kissimmee Orange and a custom mix of Johnston Daffodil and Carolina Sun Yellow. It just makes me happy! I am in love with the flag desk! Wonderful! Love that desk and the dresser is fabulous as well! I am going to have to try the CeCe paint! Thank you! Thanks for stopping by too! I know you will love the paint! Thanks for stopping by and thanks for the pin. I need to add one of those little buttons and just haven't gotten around to it! Thanks again! Kellie!!! I love this desk! Eric was in to pick up some paint and saw it in person, I am jealous! Our plans have changed for the weekend so we might be able to come up and see you tomorrow! I'm amazed at that desk! It looks fabulous! I'm liking the dresser and lamp too! Great job! The desk turned out beautiful! Love the colors on the lamp too! This post caught my eye because many years ago, I had a sideline in renovation of old dressers, even wardrobes and wooden tables, basically anything I could get my hands on for free. I would often stumble on people replacing old furniture with new and I would look at what they were going to throw out and would feel it’s such a waste. So, what started out as a bit of fun, and something to do when I was between jobs, ended up a nice little earner for me. Not exactly made loads of money, but the more adventurous I was with a piece seemed I could fetch a better price. Your renovation here put me very much back in those days and I loved the twist with the flag, and I bet you had a lot of fun doing it too. Sadly, I stopped having the time as I started work and the rest is history, but during that period, I renovated 2 tables, 2 dressers, a wardrobe and a set of chairs and each one got bolder, and I actually fetched a good price for some of them by putting them on EBay. You know what? I think you have given me the will to try it again and sound crazy but I’m not enjoying this job I’m doing, and had so much fun doing renovations. You have got me considering a career change. I had no problems finding old pieces for free in the past, why not try again? You may just have changed the course of my future, let me think now. WOW! What a moving comment. Thank you so much for sharing with me. I would have to agree....this refinishing furniture thing takes me to my happy place. It sounds like it does the same for you! I would be honored if I actually inspired you enough for a complete career change. I wish you ALL the best if that is the path you decide. Please keep me updated! Life is short! I have decided that all the money in the world is not worth it, if you not happy. Working a job you hate going to makes this short life a lot less enjoyable. It's a lot of hard work as you know, but SO rewarding, inspiring and fulfilling! Thank you again for sharing! It made my morning!